Add a stop to these historical murals to your visit. The Riverside Mural Project began in 2007 with agreements between the Federal Government, City of Windsor and the Olde Riverside Town Centre Business Association. 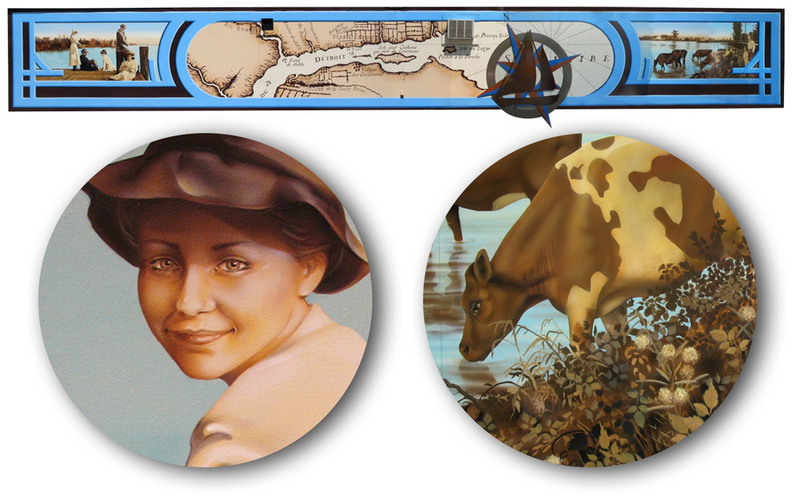 A Nautical Theme was selected for the murals after research was completed and included French Canadian strip farming, rumrunning in the 1920s and the the style of Art Nouveau. Data was collected along with vintage photos from several sources including Times Publishing, Windsor Community Museum, the Municipal Archives and two private collectros whose ancestors farmed in the area. The City of Windsor Art Studio researched, planned, designed, painted and installed the five murals within our Business Association. The project took 52 weeks to complete and the murals are located at 5415 Wyandotte (Thompson side), 5520 Wyandotte, 5640 Wyandotte, 5850 Wyandotte, 5869 Wyandotte and 5989 Wyandotte (Glidden side). The two Murals located at Glidden and Thompson depict the Compass Rose and Sailboat which has been the insignia for the Business Association since its inception. These “logos” are three dimensional and mark the entrances to the Business Association. Located at 5640 Wyandotte this mural features large ships seen against the backdrop of picturesque Belle Isle and are a very familiar sight to the residents of Riverside. The mural features the largest freighter on the Great Lakes of its day – the “Lemoyne”. Built in 1926, the Lemoyne was the flagship for Canada Steamship Lines and was the first vessel to navigate the Welland Canal in 1932. In 1968 it was renamed the Glenmohr, converted to a grain storage barge, and was eventually scapped in 1969. The inset (far left) is the “Griffin” which was built by the French explorer and fur trade Rene Robert Cavalier de la Salle in 1670. LaSalle named Lake St. Clair as the Griffin crossed this body of water on the Catholic festival of Saint Clair. In 1679, the Griffin set sail for Niagara and was never seen again. Depictions of this vessel are not actual renditions but artists’ concepts based on ship designs of the period. The next inset is of the “Walk-in-the-water which was the first steamboat to sail the Great Lakes. It was named for the chief of the Wyandot peoples, as his totem was a turtle. Built at Black Rock, NY, it was launched on May 28, 1818 and travelled eight to ten miles an hour and accommodated 100 passengers. On November 1821 it was driven ashore by gale-force winds near Buffalo, NY. All passengers and crew aboard the Walk-in-the-water survived but the steamer was damaged beyond repair. The sailboat superimposed over the a compass rose was the official icon of the Old Riverside Town Centre Business Association, which has since changed to a lighthouse, still keeping the nautical theme in place. The term “rose” comes from the figure’s compass points resembling the petals of the rose. Artists on this project were Steven Jamieson, David Kant, Donna Mayne, Jacqueline Rauline, Bernadette Robertson, Sherrill Tucker and JoAnne Weston. Located at 5850 Wyandotte, Safe Passage is of a female figure which represents the essence of sailing. Her windblown hair mimics the flowing water below. Her figure, draped in canvas, forms a protective sail that guides the vessels as they pass. The compass rose is clearly depicted in this mural, and highlights again the nautical theme of the area. Artists on this project were JoAnne Weston, Sherrill Tucker, Bernadette Robertson, Jacqueline Rauline and Steven Jamieson. Concept and design by Donna Mayne. Located at 5869 Wyandotte, Zephyrus celebrates the natural forces affecting all living things. Painted in the Art Nouveau style, this mural is the personification of a “Zephyr”, meaning a gentle western breeze. Zephyrus was the god of the west wind, one of the four directional Anemoi (Wind-Gods). He was also the god of spring, husband of Khloris (Greenery), and father of Karpos (Fruit). Artists on this project were Vandary Chheng, Christine Dexter, Jeff Hasulo, Donna Mayne, Joe Anne Plante, JoAnne Weston. Concept and Design by Jeff Hasulo.